Depth: 5" x Width: 10" x Height: 12 3/4"
Very Efficient Design - Perfect for All Ages! This design is elegant and compact. 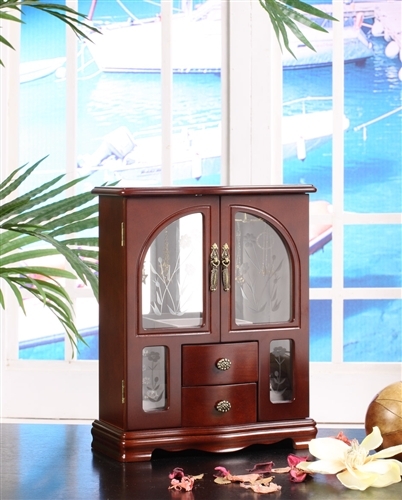 Front-opening glass doors showcase two revolving necklace hooks and double-sided padded ring rolls, a lined top holder, and two lined drawers. 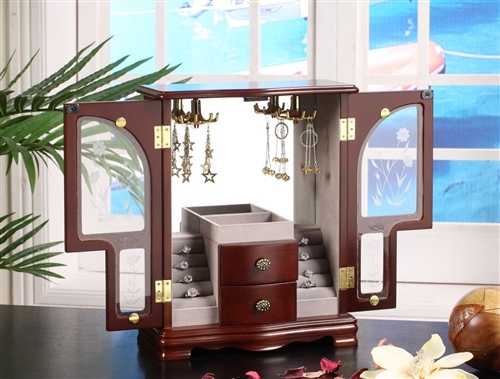 This jewelry box also has a fully mirrored back and is finished with antique style hardware and pendulum openers with glass etchings. At 10" x 12 3/4" x 5", this is unobtrusive on the dresser top or shelf. Chasingtreasure.com is an authorized seller of Nathan Brands.